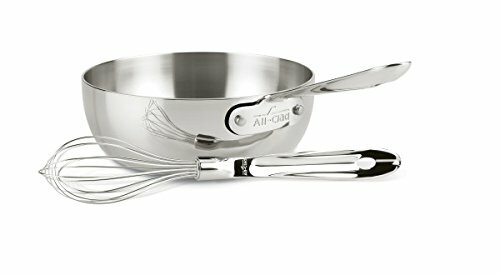 More shallow than a classic sauce pan, this All-Clad Stainless 4212 2-quart saucier with whisk is designed for foods requiring frequent whisking or stirring, including creamy sauces, risotto, polenta and custards. The pan's wider mouth allows for sauce reduction, while its curved sides allow for easy incorporation of ingredients. All-Clad’s Stainless 3-ply cookware features a thick-gauge aluminum core that attracts heat fast, while the addition of stainless steel ensures even heat distribution for consistent results across the entire cooking surface. Even more, its stainless-steel interior with a starburst finish offers natural stick resistance, and it won’t react with food, so there’s no risk of food picking up a metallic taste. Made in the USA, the Stainless cookware offers warp-resistant strength, dishwasher-safe convenience, and can be used on any cooktop, including induction. Discover what it means to cook with All-Clad’s most popular cookware collection–All-Clad Stainless.